MLA Style is a set of conventions and standards for writing put forth by the Modern Language Association. These standards allow for ease of communication between authors and readers, similar to the way physicists or mathematicians use symbols to communicate information. Why Should I Use MLA Style? As I said above, MLA Style is a set of conventions that, when adhered to, allow for the ease of communication. Using a specific style type allows readers to navigate their way through your work and presents all relevant information in a uniform way. Can you imagine if every researcher in a given discipline used a different method of source citation? Think of all the wasted time the reader would spend just trying to understand the organization of the paper, let alone the argument being put forth. The MLA Style allows for a consistent, uniform presentation of a paper’s findings so that the maximum amount of time can be spent on the content, not the formatting. Except for names and pages numbers, the margins on an MLA Style paper should be one inch at the top and bottom and on both sides of the text. When writing a paper in MLA Style or any other style, you should always choose a font that is easy to read. You also want to pick a typeface that has a clear contrast between its regular and italic style. Most teachers will specify a font they prefer and require you to use that, but if they do not, you can never go wrong using Times New Roman. Next you will want to pick a standard size to use, usually a 12-point font. 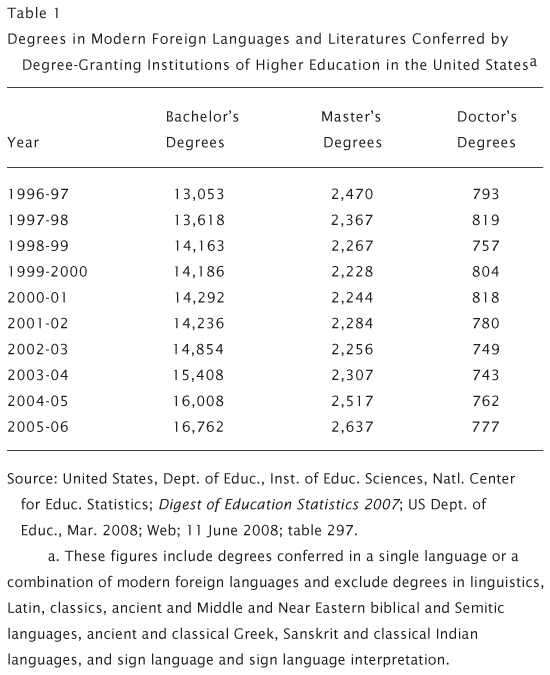 Again, if your academic department or teacher has its own standard, use that. Your paper should be double-spaced throughout its entirety, including quotations, notes, and onto your works cited page. Finally, leave one space after each period or other concluding punctuation mark unless your teacher prefers otherwise. 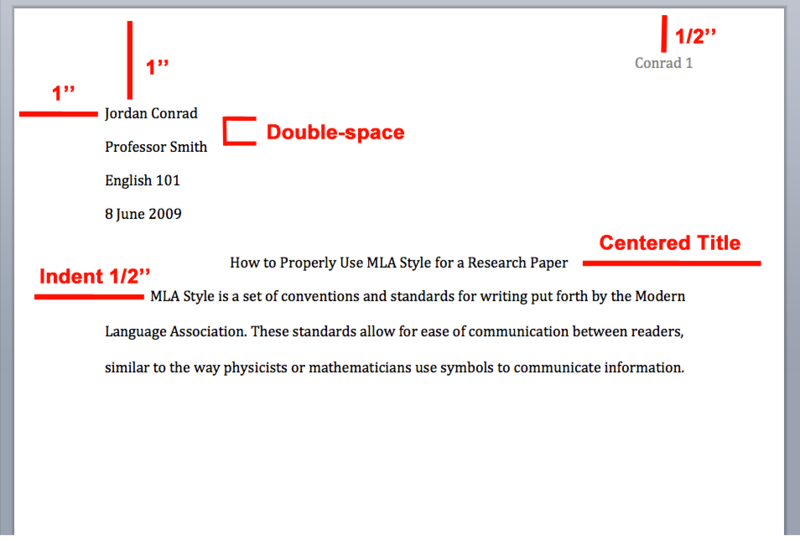 Specific instructors will differ on the need for a title page on an MLA research paper, but MLA Style does not require one. There are, however, specific guidelines for how your first page should look. As seen below, the paper should begin with your name one inch from the top and flush with the left margin. Press the return key then type your instructor’s name, the class, and the date, all on separate lines and double-spaced. Do not use a period after your title or after any of the headings in your paper. Finally, add a double space between your title and the first line of text in your paper. As with all paragraphs throughout MLA Style, the first word starting each one should be indented one-half inch. On all other pages, the running head of your paper should appear as seen below. Page numbers should have a one-half inch margin from the upper right hand corner and be flush with the right margin. Last name should appear before page number followed by a space. Each page on your paper should have an ordered page number in the top right hand corner, one-half inch from the top and flush with the right margin. Also, type your last name before the page number. Page numbers should appear on every page within a paper, but some teachers prefer not to have them on the first page. Follow their guidelines in such cases. Tables and other illustrations appear as close to parts relevant text as possible. A table is labeled Table and given a number and titled. All other visuals should be labeled Figure. If you include and tables, graphs, or figures in your paper, be sure to include them as close to the relevant text as possible. In both cases, give the table/figure a title, capitalizing as you would a heading, and include any relevant sources or noted directly below. If your visual materials do require a note, mark them with a lowercase letter “a.” to distinguish from the body of your paper (see below image). In MLA Style, you site your sources with parenthetical citation in your text that reference an alphabetical list that follows your research paper called a works cited page. This idea is nothing new and has been talked about for years (Smith 87). This idea is nothing new and has been talked about by various authors such as John Smith for years (87). This idea is nothing new and has been talked about for years (J. Smith 87). This idea is nothing new and has been talked about for years (Smith, Book Title 87). This idea is nothing new and has been talked about for years (Smith and Stephenson 87). This idea is nothing new and has been talked about for years (Smith 87, 105). This idea is nothing new and has been talked about for years (Smith 87; Stephenson 105). This idea is nothing new and has been talked about for years (Smith, pars. 7-8). MLA Style does not make use of footnotes to identify citations, unless a given citation is so long that it would disrupt the flow of reading. In such rare occasions, footnotes are permitted and should follow the “Name Page; Name Page” format. Entries are in alphabetical order by the author’s last name, or, for any sources without authors, by title. Entries should be double-spaced and be followed by a period. When there are multiple publishers listed, include all of them with a forward slash (/) between them. When listing multiple authors of the same work, use “and,” not the ampersand (&). As with the rest of your paper, your name and page number should appear in the top right corner set off by 1/2 inch. Your works cited page should be double-spaced, and each entry should have a one inch margin. For those entries longer than a single line, indent the second line and beyond 1/2 inch. MLA Style has recently undergone a change in its citation guidelines. Instead of differentiating various mediums, books, magazines, journals, websites, blogs, etc., they now have a standard set of criteria that you use for all citations. Each element is followed by the punctuation that is shown, unless it happens to be the final element in the citation. In that case, a period follows it. As I mentioned above, an individual entry should always end with a period. Also, if any individual element in the core elements is not relevant to your entry, omit it. For example, if the piece you are citing only has one author, you would omit the “other contributors” section. Now, let’s briefly go over each core element. The first core element is the author’s name. This element is self-explanatory and is usually prominently displayed on the publication. In your work cited entry, the last name of the author should appear first, followed by a comma and the rest of the author’s name. End the author element with a period, unless the author’s name also ends in a period. Twain, Mark. The Autobiography of Mark Twain, Volume 1. U of California P, 2010.
no. 1, Jan. 2013, pp. 193-200. Notice that both entries have just one period following the author’s name. If a work has two authors, reverse the first name as I mentioned above but write the second author’s name normally. As you can see, the first author’s name is reversed and the second author’s name is written normally. These names should appear as the appear on the work itself. You do not automatically alphabetize the authors’ names. If a work has three or more authors, reverse the first name and follow it with a comma and et al. This is Latin for and others. If you are dealing with a work that has been compiled and edited by an editor, he or she is still considered the “author” of the work for these purposes, but the label editor must be places after his or her name. Authors need not be individuals, either. If a corporation releases a public statement, the company itself can be listed as the author if no individual’s name is listed. If the author’s name is missing entirely, simply omit this section of the core elements and begin with the work’s title. The Autobiography of Mark Twain, Volume 1. U of California P, 2010. The next core element is “title of source.” This is differentiated from “title of container,” but we will get to that in the next section. The title of source is the title of the author’s work that you are citing. Lee, Harper. To Kill a Mockingbird. Grand Central Publishing, 1960. In this citation, To Kill a Mockingbird is the “title of source.” If the work you are citing has a subtitle, include the subtitle in the entry. Also, if the work you are citing is self-contained and independent, you will italicize the name of the work (underlining is acceptable if italics are unavailable). If, however, you are citing the title of an individual essay, story, or poem that is a part of a larger whole or collection, this is placed in quotation marks. et al., U of Massachusetts P / Center for the Book, Library of congress, 2007, pp. 365-77. In this example, “The Cultural Consequences of Printing and the Internet” is the name is the specific work within a larger collection that we are citing. For that reason, we place it inside quotation marks. If we were to cite the entire collection, we would remove this specific title. Dewar, James A., and Peng Hwa Ang. Agent of Change: Print Culture Studies after Elizabeth L.
Library of Congress, 2007, pp. 365-77. Agent of Change: Print Culture Studies after Elizabeth L. Eisenstein is a standalone book, so we italicize it. The title of a periodical (journal, magazine, newspaper) is set in italics, and the title of an article in the periodical goes in quotation marks. This same rule applies across media forms. So, the title of a television series will appear in italics. The title of an individual episode with be in quotation marks. The name of the website will appear in italics. An individual page or article will appear in quotation marks. The title of an album will appear in italics. An individual song on an album will be in quotation marks. When you citing something within a container, italicize the container and put the source in quotation marks. Williams, Joy. “Rogue Territory.” The New York Times Book Review, 9 Nov. 2014, pp. 1+. In this example, we are citing an individual article within a magazine, so we put the title of the article in quotations, “Rogue Territory,” and we put the name of the magazine in italics, The New York Times Book Review. For example, if you are citing an article that appeared in a scholarly journal that is now archived on JSTOR, the journal is the first “container” and JSTOR is the second container. vol 64, no. 1, 2010, pp. 69-88. JSTOR, www.jstor.org/stable/41403188. If there are other contributors whose participation in a work is important to your research, name these contributors in the “other contributors” section. These may be editors, illustrators, narrators, translators, etc. and Eighteenth Centuries. Translated by Lydia G. Cochrane, Stanford UP, 1994. If your source is listed as a version of a work that is released in more than one form, list this in your entry. If your source is part of a numbered series, such as a multi-volume book or journal with volume and number issues, include this information in your citation. Wellek, René. A History of Modern Criticism, 1750-1950. Vol. 5, Yale UP, 1986. The publisher of a work is usually easy to find. If two are more organizations participated equally in the publication of a work, list both of them with a / between them. Some websites list their publishing information, as they are part of various organizations, museums, libraries, etc. Such information is commonly found in the copyright notice at the bottom of a home page. If you find such information, list it. If this information is not included on the website, you can omit it. The MLA Handbook lists a number of publications where the publisher’s name may be omitted, either because the publisher need not be given or because there is no publisher. A periodical (journal, magazine, newspaper). A work published by its author or editor. A website whose title is essentially the same as the name of its publisher. In most cases, the publication date is easy enough to find, but with some online materials, a single work might be associated with a number of different dates. For example, a documentary might air on network TV one day and be added to Netflix at a later date. In such instances, use the date that is most relevant to your research, i.e., the date that is listed on the source that you consulted. Atlantic, Jan.-Feb. 2015, pp. 92-97. The final core element is the a work’s location. The location will depend on how you accessed the work. The MLA Handbook recommends including URLs for the reference of online materials, although it does list a few possible disadvantages in doing so. It leaves the final call up to the instructor, who may or may not require URLs to be listed. If your instructor does not mention one way or the other, it’s best to default to the inclusion of URLs. The eighth edition MLA Handbook is a much needed update to MLA Style. It still isn’t as clear as it could be, but it eliminates the need to check individual citation requirements for the literally dozens of different entries that are possible. Instead, it lists a set of broad criteria that applies to any and all publication types. You will not need every “core element” in every citation you have, but they provide you with a roadmap to creating citations with ease. A Writers’ Reference, 8th Edition by Diana Hacker. Many of the specific citation examples were taken from the MLA Handbook, 8th Edition, 2016. 1 What is MLA Style? 2 Why Should I Use MLA Style? 3 Who Uses MLA Style?